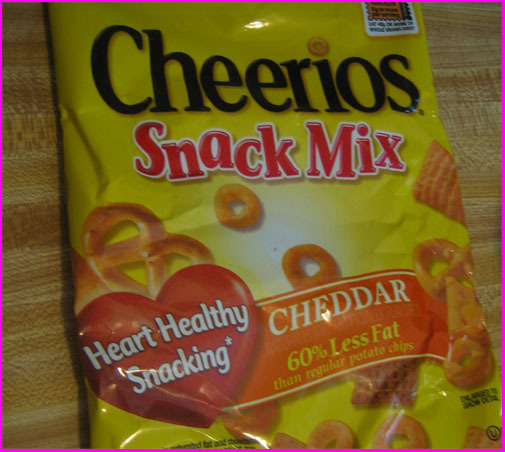 Food Review: Cheerios Cheddar Snack Mix – With Bonus Home Made Cereal! One common accusation I assume anyone who has been reading this site for a while would have is, “Why doesn’t this site ever look any better?” I would say that’s a fair point. There have been some changes made to the site, but I’m not sure if I am able to use the term “improvements”. In all fairness, I don’t really have much of an idea what I’m doing when it comes to web design, formatting, and the like. Most of the best changes weren’t even done by me. And sure, the likely retort to that is, “Then maybe you shouldn’t have a web site.” And that is true as well. But then where would you read ill-informed, poorly written, opinionated writings about pop culture and other entertainment minutia? Oh, the other ten thousand sites that are dedicated to the same things? Good point. In my defense, as unpleasant as much of the designs here look, they actually used to be significantly worse. For example, take the first two things I ever wrote online. Exhibit A & Exhibit B. Are you kidding me? One is a huge wall of text in bright turquoise, and the other… well, its flaws don’t explaining. And yes, starting an article with multiple paragraphs insulting the web site you are reading probably isn’t the best start. But I’m awful with introductions, and this sort of segued into the topic at hand. Sort of. Sadly, one of the things I have written that is without a doubt one of the most popular things I’ve done is something I put the least effort into. 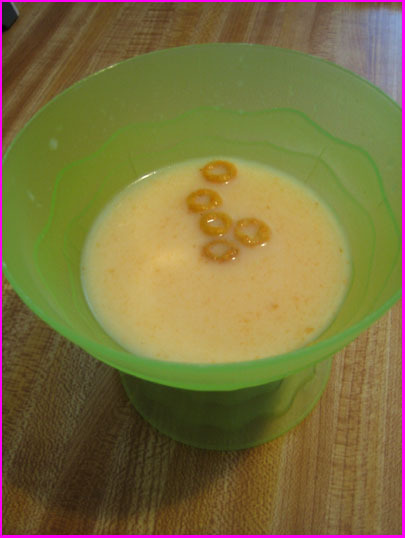 This is the aforelinked to Home Made Cereal Reviews. These were born from (no surprise here) extreme boredom, as well as access to someone else’s food that I didn’t mind ruining by pouring milk on it. Despite these being what I think were the only things that people actually requested I do more of, I never really wanted to. Because they were stupid. But, as I’ve already shown, I’m not above doing stupid things with free food. 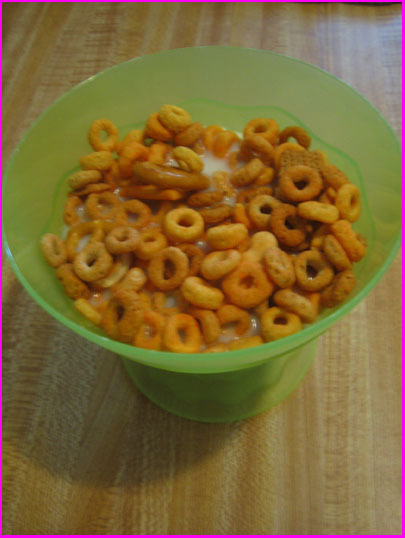 A while back, I was on the Cheerios web site, where they had a request form for a free sample of one of their Snack Mixes. Which are basically Chex Mix, replacing the Chex with (shield your eyes from this blindingly obvious revelation:) Cheerios. To answer any possible inquiries, no I don’t know why I was at the Cheerios web site. I mean, I like most forms of Cheerios. Frosted and Multi-Grain are awesome, and Honey Nut is very good as well. Although Honey Nut Cheerios are one of those cereals you’re only happy about while you’re actually eating them. When you’re pouring the bowl, it’s usually because there’s nothing left in the Awesome Cereal category. Even regular Cheerios are pretty good. The Fruity, Yogurt Burst, and Berry Burst are all solid choices. The only one I’ve tried that I can safely say are gross are Apple Cinnamon. Apple Cinnamon Cheerios are disgusting. And I’m not even going to attempt Banana Nut. When my sample arrived, I was distressed to learn that the random flavor I had been chosen to receive was Cheddar. Most “cheese” flavored snacks disgust me. Cheez-Its are good, but the vast majority like Nacho Doritos and those horrid party mixes are just wretched. But hey, free snack. After two bites, it became clear that this mix was gross. Luckily, I worked out the math in my head that Cheerios actually are cereal, so this would make a logical, triumphant return to a home made cereal reviews. Terrible, off center picture taking aside, there you have it. Look at that sickly orange hue. I’m already filled with dread. Aaaaand, now it’s worse. I figured I should work quickly, since the only way this could get worse would be a soggy cheese flavored cereal. As for the experience itself, there’s not much to say. I already reviewed Cheez-Its, a snack I actually like, over a decade ago (jeez), and those were disgusting. 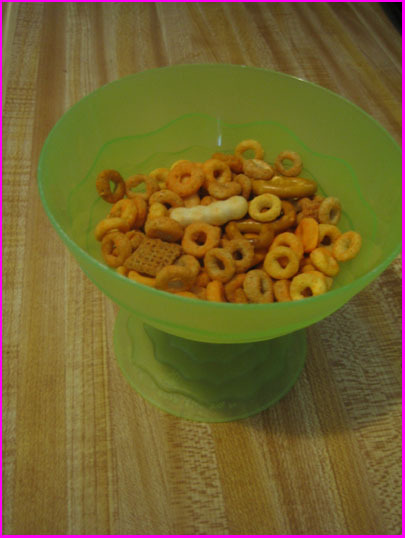 Since I didn’t even like Cheerios Snack Mix in the manner in which they were intended (not submerged in milk), they were only likely to get worse. Which they did. Don’t let that image fool you. The milk was not the kindly, Golden Graham tan hue that you see here. It was a far more sinister shade of orange, like a French Vanilla ice cream that just couldn’t seem to get the color right. I’m not sure why I even need to tell you this, since it should be painfully obvious, but the milk was even worse than the cereal. It was like drinking from the drain of a Cheetos factory after they hosed the floor down. And there you have it. the retro revival of home made cereals. I’m not sure when the next one will be. I’m assuming there won’t be another ten year wait. But come on, you should be familiar with the frequency of my writing. Ten years doesn’t actually seem like too bad of an estimation.